On a special request of a Grapevine follower, we’ve jotted down a list of applications which would make a better music player than your default software. There’s numerous apps out there on the Play Store but we covered only a limited number on the basis of unique features. If your favorite music player isn’t here, feel free to tell us about it in the comments section. 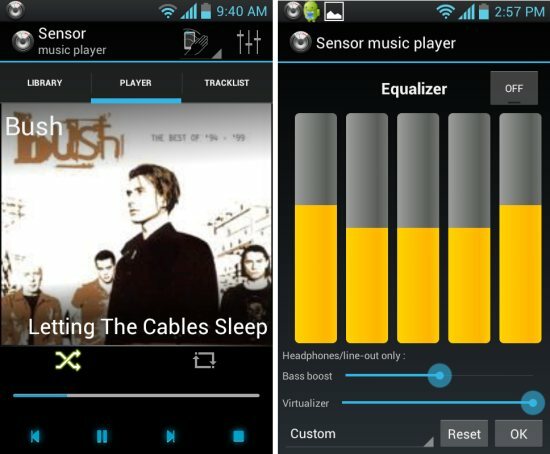 The name says it all, Poweramp boasts a lot of features like a graphical equalizer, treble & bass adjustments, gapless and crossfade playback as well as a tag editor! The free version lets you use it for two-week trial and charges Rs. 60 for further usage with additional components. From the house of Indian smartphone maker Lava, Fusion is a free to use app it permits you to go through different musical charts and even access online radio! It also featured as an alternative to Apple Music because it not only plays music from your library in a beautiful outlay, it syncs and shows their lyrics! One of my favorites, it delivers your music in a minimalistic design with a customizable interface. It supports almost every audio format and is free to download but a few additions would cost you a nominal fees. If you’re bored with the design of Google Music Player, then Shuttle is for you! It also has a neat equaliser and a Suggested tab to help you pick a song quickly from your large library. This particular app doesn’t show off a spectacular design but it works pretty well with iTunes identical to an iPhone. However, you’ll have to shell out Rs. 60 and buy theiSyncr app for Rs. 99 to afford the luxury. This one here is the only app which exploits the various sensors on your phone, hence the name. With a single wave of your hand can play or skip a track! The gestures like this one is available in the paid version but it offers decent configuration for free.